Every now and then, I can hear things that my mom said to me. After reading today's readings & gospel, I heard her loud and clear. I think it was after I read the book "3 Days of Darkness". Seriously...don't even look at this site unless you want to get scared out of your wits; which goes right along with today's readings. I'll get to that in a minute. Back to my mom: I talked to my mom about this prophecy, and she said, "No one knows the hour when Jesus is going to come." She was definitely next to me this morning as I read and reflected. 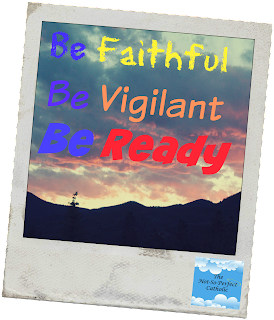 We should be faithful, vigilant, ready, but not to the point of being scared. We aren't called to live our life in fear, but live our life as if each day is our last, each moment is our last. I remember in college, the fraternity where I was a little sister had an "end of the world" party. And yet we're still here. I guess that pastor that claimed to know the hour was a little bit off. As I reflected on the first reading (from the Book of Wisdom), the Jewish people knew to get ready---they had signs and heard the words of the prophets. We also know to get ready, we only have to heed the warnings. This is setting up the biggie...the Gospel. God has given us everything we need to be ready for the 2nd coming. He has given us priests who are in charge of the Church...the building and the parishioners. The greatest gift we have been given is communion. If we tire of waiting for Him to return, we may become complacent and start being lax in our faith. (As I write this, I realize it's kind of like what's happening with me right now; since vacation I'm having a hard time getting back in the routine and "feeling it".) We may fall away from our faith. God entrusts us with faith. If we choose to go against Him, we will eternally pay for it. I've often said that my faith is very personal; that's why I feel very uncomfortable when someone begins talking to me about "being saved" and pushing their religion/faith on me. We have an obligation to not keep our faith private. We are called to share that faith with everyone we meet...not necessarily through words, but through our actions. It goes back to the question: Do people you meet know that you're a Christian without you telling them? 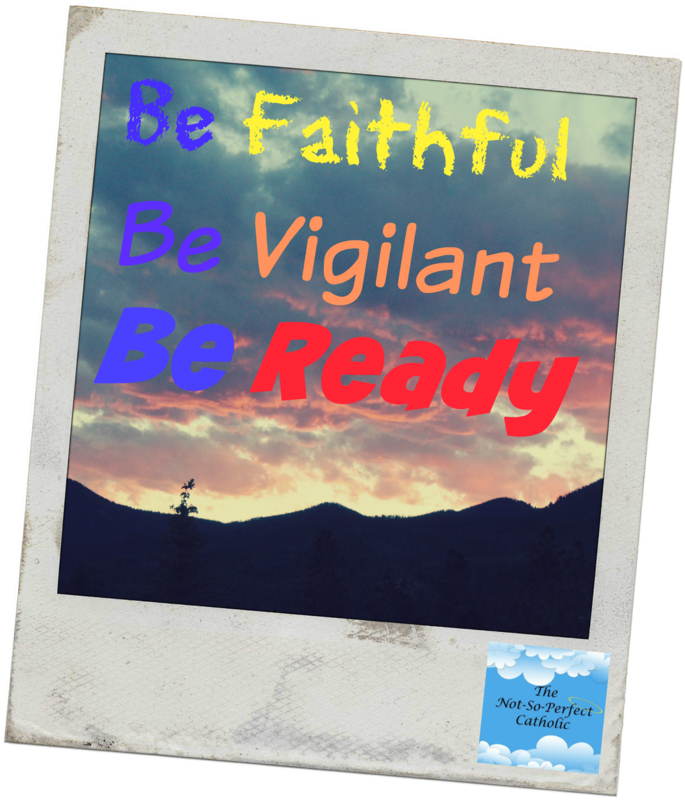 During the homily, the priest's first words were "Be ready". It's necessary to set yourself aside and build treasure for eternal life. However, we should do so not in fear. We should recognize the gift of life. HOW??? By living out our faith that has to be deep in our souls. It's not just going to Mass every Sunday, it's taking the Eucharist out into the world. this shouldn't be done out of guilt, but out of joy. The treasure isn't to be kept to yourself, it's to share with others. As he always does, he left us with a couple of questions to think about: What are you doing with the treasure of faith? How can you live out that treasure? A couple of thoughts. Growing up, my family was only 1 of 3 Catholic families in our school (and 1 of the families wasn't practicing). I heard my protestant friends talking about Revelations and the 2nd coming. I like the Catholic belief on that a lot better. It's not one of fear; it's one of joy. It's one of being elated when Jesus comes again, because we have lived our lives to get ready for that time. We have taken that special treasure out to share it with the world. If we've lived our life as we should, we should look forward to when Jesus comes again, not be afraid of it. Hearing the message about taking the Eucharist out into the world and doing so out of joy is something I need to be reminded of right now. I'm having a very difficult time having a good attitude about going to work. I've been doing this for 34 years; I have no doubt this is what God has called me to do, and I do love my job. I just can't figure out why I'm having this attitude right now. I'll take this message with me out in the world this week and will hopefully get back on the right track! Wonderful thoughts. Don't the scriptures call the Second Coming "the great and terrible day of the Lord?" (or maybe it is great and dreadful, or some other adjective like it.) I think it will be a great day if we're prepared. Less so if we're not.